Our typical hostel is a charming 100+ year old traditional Andalusian house with a friendly, urban feel. The hostel was created as an idea by travelers that want to make your stay in this beautiful city as comfortable and memorable as possible. The Lights Garden is located in the magnificent historic center of Malaga. It is a great starting point to explore the area that has so much to offer! Our house is tucked in an idyllic side street within a short walking distance to all the main sites: Museo Picasso, Museo Thyssen, the famous Calle Larios, Malagueta beach, la Alcazaba, the Cathedral, as well as tons of theaters, restaurants, bars and clubs. Like all travels are different, our accommodations are different: We offer shared rooms with or without balcony all with a comfortable, modern look. We want you to feel at home - relax and meet fellow travelers in our lounge, enjoy the Malaga sun on the roof deck terrace and cook for your friends in the communal kitchen. 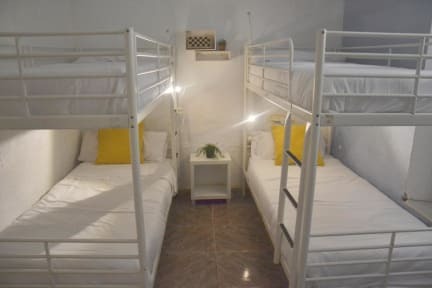 The hostel also provides free WIFI in every room, ceiling fans and heaters, laundry service, beach towel rental, car/scooter rental and a multilingual reception with information desk (we speak: Spanish, English and German).